As pasta sauces go, this is one of the nicest. It is certainly easy, as most Italian tomato sauce recipes are. Heat a large skillet until hot. If it is non stick, spray with non stick spray. If not add a touch of oil. Add the red pepper, onion and garlic, and saute until the vegetables are tender. Add the tomatoes, sugar, salt and pepper. Bring mixture to a boil. Cover, reduce heat, and simmer 10 more minutes. Uncover and cook for an additional few minutes to thicken the sauce. Add the cream and heat through. Add pasta, stirring well. Cook over medium heat 2 to 3 minutes or until thoroughly heated. Serve with lots of parmesan cheese. If you want a sauce with meat in it, just brown 8 ounces of ground beef with the onion, garlic and pepper and season to taste. If you would like to cut the fat in this recipe, replace the cream with an equal amount of evaporated skim milk. The taste will be similar, but the fat content will be cut drastically. Up the vegetable count and make this a really healthy pasta recipe by adding more vegetables. Add chopped zucchini or mushrooms to the sauce when you add the tomatoes. Or any other vegetable that you think might taste good. Cooking for a larger group? Just double or triple the recipe, tasting to adjust the seasonings. Make it healthier by serving the sauce over whole wheat pasta. Although this lovely pasta recipe is usually served as a vegetarian pasta meal, you can certainly add meat to it if you would prefer. Just brown 1/2 pound of ground beef or a thinly sliced chicken breast. If you are using meat, add it at the beginning, to brown with the onions and garlic, then let it cook with the tomatoes to soak up that lovely tomato flavor. I like this as a vegetarian meal because I think that meat eaters often get lots of meat in their diet. An occasional (or more than occasional) vegetarian meal is great for our health. Whether vegetarian or the meat version, I think you will really enjoy the flavors of this wonderful Italian sauce. 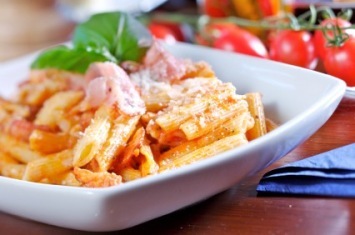 For more pasta sauces and other Italian recipes, look here.